Kellogg Community College is hosting a retrospective exhibit of nearly three dozen works of sculpture, mixed media and assemblage by the late Marshall artist Tim Sykora through October. The exhibit, titled “Tim Sykora 1958-2014: A Retrospective Exhibition,” opened Sept. 24 and will run through Oct. 24 in the Eleanor R. and Robert A. DeVries Gallery in KCC’s Davidson Visual and Performing Arts Center, on campus at 450 North Ave., Battle Creek. The exhibit is free and open to public for viewing during regular gallery hours, which are 8 a.m. to 4:30 p.m. Mondays through Fridays. A gallery reception highlighting the exhibit, which is also free and open to the public, will be held from 5 to 9 p.m. Friday, Oct. 19, as part of Fall into the Arts. Fall into the Arts is an annual art appreciation event in Battle Creek, highlighting artists ranging from musicians and crafters to photographers and sculptors. Sykora, who died in 2014 at the age of 55, held a bachelor’s degree in art and a master’s degree in K-12 education, both from Ball State University, and was a licensed journeyman electrician and substitute teacher at Marshall Public Schools. The exhibit is curated by his wife, Patrice Marquardt, of Marshall. 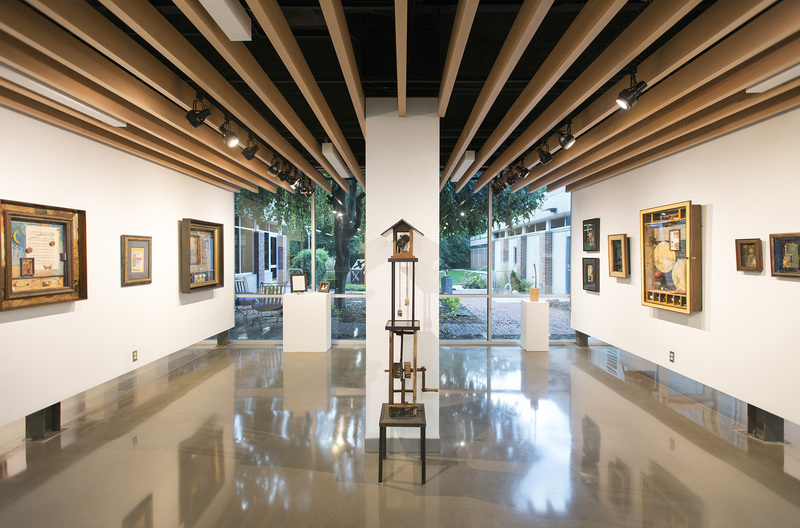 Many of the works in Sykora’s exhibit include found art “assemblages,” works created from a grouping of found or unrelated objects, presented in shadowboxes. Sykora’s images were spontaneously created, with composition inspired by artists like Joseph Cornell, Jim Dine and Kurt Schwitters. In the artist’s statement, Sykora says his early work was also influenced by surrealist imagery, while his later work was more refined and minimal. All of the works included in the exhibit are for sale; a portion of any sales will be donated to art education programming at KCC. An untitled sculpture by Sykora was installed in the courtyard of KCC’s Roll Health and Administration Building on June 28 as part of the College’s Art on Campus sculpture initiative, which brought 10 new outdoor installations to the North Avenue campus this past summer.